The mother of Helen Morgendorffer, Rita Barksdale, and Amy Barksdale, who is never directly seen or heard from in the Daria series. Her presence, however, is felt from Erin's wedding onward ("I Don't"). 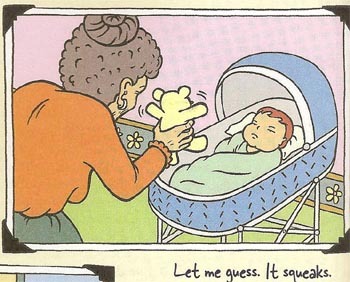 An old lady who could be Grandma Barksdale is shown with a (bored) baby Daria in "The Daria Diaries". It is implied in "I Don't" that she's unable to travel at that time, and also implied here, in "Aunt Nauseum", and in "A Tree Grows in Lawndale" that she is well off enough financially to afford showering Rita and her daughter Erin with gifts and windfalls. (Glenn Eichler has said Helen didn't grow up in a wealthy household, but the show itself does show Barksdale with money) We know she could help fund college funds for Daria and Quinn, but doesn't. "Diaries" has Helen making a note to talk with Rita and Amy about who gets Grandma Barksdale for the holidays. "The Daria Database" has Daria refer to a visiting grandmother as being incontinent, which Ruth Morgendorffer doesn't seem to be, but it's unclear if Daria was being serious or not. If this was a reference to Helen's mother, she visited the Morgendorffers at Lawndale around Season 2. Daria claims in "Jake of Hearts" that her gran offered her $100 to change her hair. Of her three daughters, she is closest to Rita and appears to favor her over Helen and Amy. This spawned a long-running feud between the three sisters that is finally (one hopes) resolved in "Aunt Nauseam". Before then, Helen occasionally ranted about the unfair treatment Rita and Erin get, said rants being remarkably similar to her husband Jake Morgendorffer's rants against his father. Rita once attacked Helen and Amy for never calling their mother themselves, and said that they were partially to blame for the bad relationship; Amy gave a bitter response (with Helen's agreement) of "Why should we when she's never offered us the slightest bit of encouragement or appreciation?". While Helen and Amy concur that Rita was the favourite daughter, Rita and Amy have concurred that their mother wanted them to work as hard as Helen did, which left Rita bitter that her sister made her look "lazy." Notably, "Aunt Nauseam" also features a phone conversation between Helen and her mother; while we only hear one side of it, it's clear that Grandma Barksdale is praising Helen, which makes Helen reluctantly agree to help the situation with Rita. In fanon, it's assumed she paid for Brian Danielson to fly out to Switzerland to have a second honeymoon with Erin, saving their marriage ("Aunt Nauseum"): Brian didn't have a job to pay for it on his own, and she'd already sent Erin there. The character was expanded in numerous fanfics, with many divergent names and variations on her personality. C.E. Forman gave her an equally wealthy half-sister, Aunt Eleanor, and the same rivalry that Helen/Rita had with Amy and Quinn with Daria. Kara Wild named her Evelyn in the Driven Wild Universe and made her generally crusty, but loving. Later, Richard Lobinske would create Tess Barksdale, the southern matriarch in the fanfiction series, Falling Into College. The "punkverse" shared world has Edie Barksdale, a moderately wealthy woman from a 'good' family: Brian Taylor's 1980s-set Moving Pictures has badly coping after the death of her husband and having a disintegrating relationship with Amy and Helen; in Charles RB's "God Save The Esteem", she was cut off from seeing Daria early on and in the 00s, is trying to revive their relationship in an attempt to 'retrieve' the girl. Kristen Bealer depicted an off-screen Bethany Barksdale in "For Better or For Worse, For Richer or For Poorer", trying to force Erin and Brian to get back together so she won't have to tell her social circle about another broken marriage in the family. This page was last edited on 27 May 2018, at 15:30.